Welcome to our Jack Russell page. Every Jack Russell themed item on this page is made by the craftman at our Warner New Hampshire shop. As you can see, many of our Jack Russell items are personalized. We hope you can find that special personalized gift for your Jack Russell loving friend. 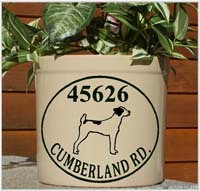 Our two gallon crocks are 9" tall, they are deeply etched and hand painted. 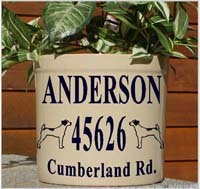 Each crock features a Jack Russell Terrier silhouette and your personalization. They are $67.95, and generally ship within 3-5 business days. 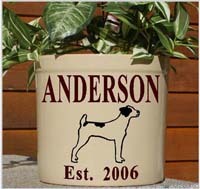 Click on the Jack Russell Terrier personalized crock picture, for ordering information. 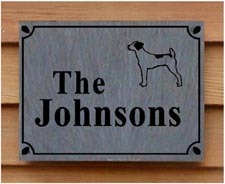 The verticle slate sign, measures 12" by 9", it features a Jack Russell Terrier silhouette and one line of personalization. It is predrilled for hanging, and screws are provided. It costs $39.95 and will generally ship in 3-5 business days. The horizontal slate sign measures 9" by 12". It features a Jack Russell Terrier silhouette and one or two lines of text: The personalization is Deeply Etched then painted. It is predrilled for hanging, and screws are provided. It costs $39.95, and will generally ship in 3-5 business days. The slate is a natural green/grey in color, and the color does vary. The deeply etched 12" x 12"clock comes with a quartz time piece. 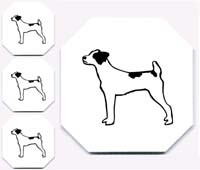 It features a Jack Russell Terrier silhouette and one or two lines of text. It costs $55.95, and generally will ship in 3-5 business days. 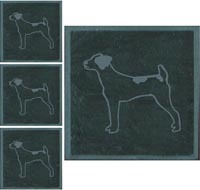 The set of 4 tiles, featuring an etched Jack Russell Terrier silhouette is approximately 4" x 4". They are equipped with a protective cork backer. The price for 4 is $24.95. They generally will ship in 3-5 business days. 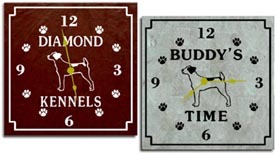 The set of 4 tiles, featuring an etched Jack Russell Terrier silhouette are approximately 4" x 4". They are equipped with a protective cork backer. The price for 4 is $24.95. They generally will ship in 3-5 business days. 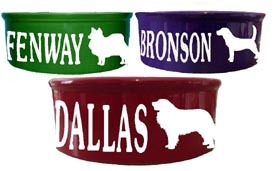 We offer 2 sizes of Jack Russell Personalized dog bowls, 9" and 7" in burgundy, blue and green. The etch effect is sealed and is white. Click on the Jack Russell dog bowl picture for ordering information. The slate memorials measure 6" x 8", and are deeply etched. It features a Jack Russell Terrier silhouette, one line of text, and the years of life. They cost $29.95, and generally ship in 3-5 business days. 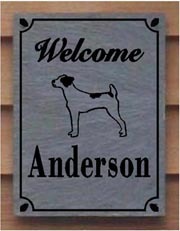 Click on the Jack Russell Terrier slate memorial picture for ordering information. The Jack Russell Terrier Weathervane is made from cast aluminum. The Jack Russell Terrier silhouette is made from an extremely durable 1/4" thick solid black satin pvc. The Jack Russell Terrier weathervane costs $85.00, and with globes is $110.00. It will ship in 3-5 business days. 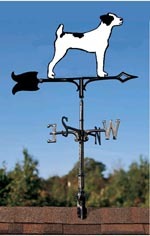 Click on the Jack Russell Terrier weathervane picture for ordering information. Click on the Jack Russell Terrier mailbox silhouette picture for ordering information. Click on the Jack Russell Terrier hanging silhouette picture for ordering information. 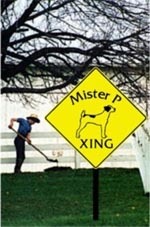 The Jack Russell Terrier 10 x 14 inch double sided sign and hanging bracket cost $67.95. 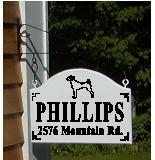 It is constructed on solid sign board and features a Jack Russell Terrier silhouette and your name, and/or your address. It comes with a bracket ready to hang. The Jack Russell Terrier archtop pine sign is first clear coated, and then lettered with your name and/or number. It features a Jack Russell Terrier silhouette and one or two lines of text, they and are drilled in both sides for mounting and a wooden plug to cover the screw holes is provided. A good value for $39.95, and will ship in 1-3 business days. These solid pine signs are first clear coated, and then lettered with your name and/or number. It features a Jack Russell Terrier silhouette and one line of text, they and are drilled in both sides for mounting and a wooden plug to cover the screw holes is provided. A good value for $29.95, and will ship in 1-3 business days. The magnetic ovals are 4"x 6" they are white, with a black Jack Russell Terrier silhouette. They cost $6.00. The magnetic silhouettes range from 4" to 14" and are available in black, white, or gold metalic. The prices start at $6.00. They generally ship in 1-2 business days. Click on the Jack Russell Terrier sign picture for ordering information. Click on the assorted Jack Russell Terrier sticker picture for ordering information.